A MONTH ago, I was invited out to lunch by Bobby Laurel and his sister Sallie Laurel-Lopez, who both help manage the Lyceum of the Philippines University which was established by their grandfather, the late President Jose P. Laurel, Sr., in Intramuros 60 years ago. I’m writing a biography of Bobby’s and Sallie’s father, the late Sen. Sotero “Teroy” Laurel, and we’d set up the lunch to interview some old Laurel family friends. The interviews went well, as I’d expected. What came as a pleasant surprise was the venue for our lunch—the Bayleaf Hotel, specifically its 9 Spoons restaurant on the 9th floor. Bayleaf is just a few steps away from the main LPU campus. Externally, the nine-story building blends in with the Spanish colonial architecture of the district; it was an old building acquired from the Licaros family, and subsequently and brilliantly renovated by TI Vasquez Architects & Planners. Its interiors and amenities couldn’t be more modern, with five function rooms that can accommodate up to 500 people, and large LCD TVs and wi-fi access all over the place. I saw these rooms and the Bayleaf’s suites myself, having asked for a guided tour of the place after a sumptuous lunch at the 9 Spoons (so named after the nine children of Teroy and Lorna Laurel; and before I forget, the crowd favorite at the 9 Spoons lunch buffet—the crunchy bagnet—is to die for). The 57 rooms—which start at around P4,000 a night, including breakfast—are very smartly appointed. On top—literally—of all these is the Bayleaf’s killer feature, which isn’t even in the building itself: the view. The Bayleaf’s roof deck offers a 360-degree view of Manila Bay, Intramuros, and has quickly become the hotel’s choicest spot. The weather permitting, you could do worse than sit here at sunset with friends, sharing a cold beer. The Bayleaf’s facilities tie in neatly with the Lyceum’s offerings in Culinary Arts and Hospitality Management, among its strongest programs today (historically, the school had been known for its Law, Foreign Service, and Journalism programs). LPU President Bobby Laurel, however, clarified that “We’re running Bayleaf as a business first, and as a training ground second. I’d describe it as a 3-4-5 star hotel: 3-star price, 4-star amenities, 5-star service. We got the best people we could find to run it. This is going to be an investment, a learning experience that we can duplicate in the other campuses if we do it right.” An avid and talented amateur photographer, Bobby also did some of the pictures in the hotel and the Cioccolata coffee shop on the ground floor. The next time you’re in Intramuros and feel like having a hearty lunch or a cool drink at day’s end, give Bayleaf a try. Better yet, stay overnight and enjoy the view. I never thought I could say this about a city whose infernal traffic and grime I’ve resigned myself to embracing, but from the Bayleaf’s roof deck, Manila never looked so good. SPEAKING OF Manila, I don’t get my fellow Manileños who’ve been griping about how badly Manila was portrayed in The Bourne Legacy, with its visual emphasis on the city’s poorer districts. I wonder what they were expecting when the Bourne people came over and said they were going to shoot here. Greenery? Bonifacio High Street? They can get that more cheaply—miles and miles of it—in Southern California. Of course Manila isn’t all poverty (don’t we know that, every time we ride or drive into one of its gated communities, leaving our pedestrian IDs at the guardhouse), and of course it isn’t fair to portray just one side of things. But movies aren’t about fairness, especially action thrillers with the singleminded purpose of pumping more adrenaline into your bloodstream. They’re about achieving a certain effect, a mood or a backdrop against which the plot can move forward without too many distractions. If there’s anything to complain about in the movie, it’s how the plot—so rich and complex at the beginning—seems to peter out in the end, after the long and well-executed chase scene. I don’t mean this to be a spoiler, but this movie is begging for a sequel (as if it wasn’t already a sequel to a sequel). Since Jeremy Renner and Rachel Weisz—who turned in very creditable performances—have already sailed off into the sunset (and more literally than you think), I don’t imagine we’re going to see more of Manila in this franchise’s future. Time to hit the slums of Mumbai? THE RECENT flood—all the more infuriating to many because it didn’t even have a name—reminded me of my own baptism as a reporter for the Philippines Herald back in 1972. I was 18, a freshman dropout who’d wangled his way into a reportorial job at a broadsheet, realizing the dream of my albeit brief lifetime. I’d been with the Herald for just a few months writing mainly news features when what would be called the July-August floods of 1972 broke over our heads and turned Manila and much of Central Luzon into a giant bowl of mud soup, like Ondoy a month long. That truly was a downpour of biblical proportions. I did some research at Public Works and realized that the flood plans for Central Luzon hadn’t been reviewed or revised since 1935. I wrote that story up, and got it into the front page—the first time anything I wrote was ever worth the front page, so I’ve kept the clipping to this day. But more interesting things were in store for me. I reported for work one morning, only to be told to return that evening and to pack a change of clothes. I was going to be sent out on a Navy ship to cover relief operations in Pangasinan, which was still heavily flooded. The ship turned out to be an LST, a Landing Ship Tank, which seemed to me to be a large metal box floating on the ocean—that’s certainly what it felt like when we sailed in rough waters along the coast that night. The next morning my photographer and I disembarked in Lingayen Gulf, wading into the water like an invading army, and plunged into the wettest excursion of my life. The US bases were still around, and the folks at Clark had sent a big rubber raft along, and I clambered aboard, half-reporter and half-flood victim, to get stories from the flood. We spent a cold night at the governor’s house amidst bags of relief goods, after I’d phoned in my story to a deskman who took it all down on a typewriter with the phone clenched between his cheek and shoulder (ever wonder how newsrooms worked before cellphones and email?). The following day an American helicopter arrived, a Jolly Green Giant they might have been using in Vietnam, and we hopped aboard—not knowing that its next stop was Clark Air Force Base. Stepping out of the chopper—smoother than any plane I’d ever flown, although I hadn’t flown too many then—I saw and gawked at all those warbirds on the Clark tarmac and imagined for a minute what it would be like to be transported out of this infernal wetness into some place like California; but I settled for the chocolate cake at the commissary (another word added to my vocabulary). Sunny California would come into my life eight years later. Back in the office the next day, the desk then sent me out to interview Mrs. Imelda Marcos in Malacañang about the Palace’s relief work. She met me in front of a mountain of Nutribuns. I don’t remember much of what she said—charmed witless, I suppose. What can I say? I was eighteen, with hardly a notion that, just a few weeks down the road, an even darker and longer storm was about to fall all over the islands. 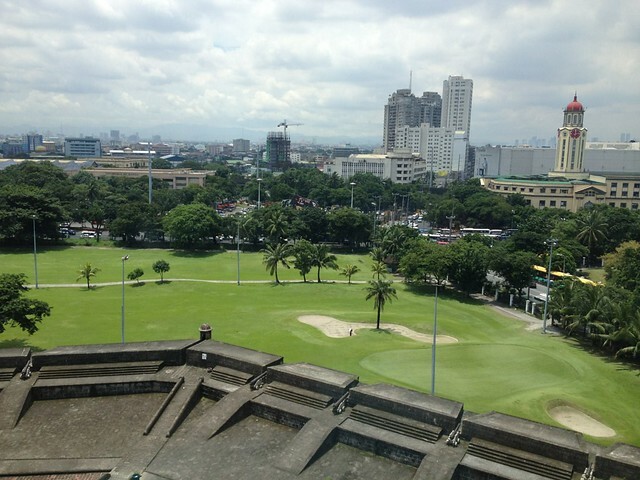 This entry was posted in Art & Culture, Fun, Travel and tagged hotel, Lyceum, Manila, travel by penmanila. Bookmark the permalink.